Animal Therapy Systems is owned and managed by Joyce Jackson. Because of her vast experience in the field we have listed her qualifications and therapy experience as well as her teaching experience and awards on this page. Joyce's love for horses started as a young child. 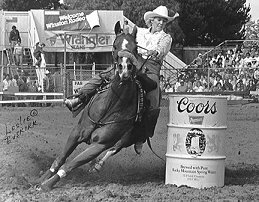 She owned her first horse at twelve and went on to become an NFR (National Finals Rodeo) Qualifier in the Women's Professional Rodeo Association. 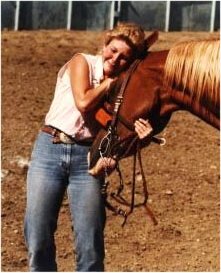 She was introduced to the therapeutic aspects of equine health care by caring for her own horses and keeping them competitively sound for the demands of the Pro Rodeo Circuit. Her background in the Pro Rodeo World and as an NFR Qualifier provides a solid ground for her knowledge of horses as well as providing top quality care in order to maintain such a high rate of success. 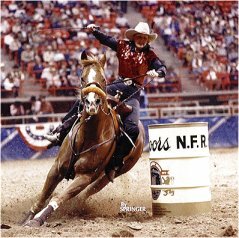 In 1988, Joyce's own NFR barrel horse Trent Tivio (Featured in our Top Story Section) was injured during a Pro Rodeo. After months of veterinary care with little or no progress, and having many veterinarians tell her that nothing else could be done for him, Joyce did not give up. Euthanasia was unacceptable to her. Seeking further alternatives she finally located a veterinarian that used the Electro-Acuscope/Myopulse Therapy System in his animal practice. Joyce and the veterinarian worked on a rehabilitation program together. When they finished, Joyce and Tivio were able to once again compete on the Pro Rodeo Circuit. The first rodeo they competed at was the Calgary Stampede (held in Calgary, Alberta, Canada), where they won the rodeo and became the 1988 Calgary Stampede Barrel Racing Champions. They went on to win more money at the pro rodeos in the next month (after Calgary) than they had managed to accumulate in all of the previous months of that season combined. Joyce decided at that point that she wanted to learn about all aspects of equine therapeutic rehabilitation so she started by becoming a Certified Equine Electro-Acuscope/Myopulse Therapist and began working on her own competitive horses. Two years later she was involved in an automobile accident. The prognosis was that she would never ride again. Faced with the possibility that she would never be able to compete at rodeos (which was her livelihood), she was then encouraged by colleagues, friends and many animal health professionals to start doing rehabilitation work on others horses. Luckily in a years' time she recovered completely from the accident and went on to barrel race professionally again, but the year away from competition gave her the opportunity to get focused on animal health and therapy. Because of the need for helping competitive horses perform at optimum health, in 1990 Joyce decided to study many different methods of working with injured horses. She also started her animal rehabilitation business Equine Specialty Services during this year. Joyce soon became one of the primary developers and instructors of the Equine Electro-Acuscope/Myopulse Certification Program, as well as an Animal Nutritional Consultant. She began presenting lectures, seminars and teaching classes on various Animal Health and Rehabilitation subjects. That was over a decade ago and she has never looked back. Since 1988 Joyce has been continually invited to lecture at Equine Expos and functions throughout the US and Canada. The variance of classes she has attended as well as the wide variety of courses she continues to teach only add to her value as both an instructor and therapist. Over the years Joyce has worked in conjunction with many veterinarians, trainers and owners to help animals. She truly believes in the "Whole Horse" approach, and feels that in order for animals to heal properly, they need to be healthy from the inside out and not just pieced back together section by section or injury by injury. Joyce is also a big believer in a preventative maintenance program for animal athletes. In January 2002, Joyce had the opportunity to acquire the Exclusive Distributorship for the Animal Calibrated Electro-Acuscope/Myopulse Therapy System. As she had been working with this equipment since 1988 as an instructor and certified therapist, she welcomed the chance to lend her expertise on a distributor level. Equine Specialty Services thus evolved into Animal Therapy Systems. Equine Specialty Services is still an intricate part of her business, but it has now become the rehabilitation division of Animal Therapy Systems. We'd like to invite you to scroll through her qualifications and as you do so, understand that Joyce is a highly respected and honored individual who has always stepped up to the vast array of challenges presented to her in the equine, domestic, and exotic world of animals. Whether you have the desire to become a certified animal therapist or a need to call upon her services as an animal therapist or Animal Health Instructor, Joyce is well qualified to provide the most successful path for your needs. after breaking the CGA State Record in Barrels.